USA will take on England in SheBelieves Cup on March 2 at 3:30 p.m.
CHICAGO (December 6, 2018) – U.S. Soccer announced on Thursday afternoon that the U.S. Women’s National Team will return to Nashville as a part of it preparations for the 2019 FIFA Women’s World Cup. 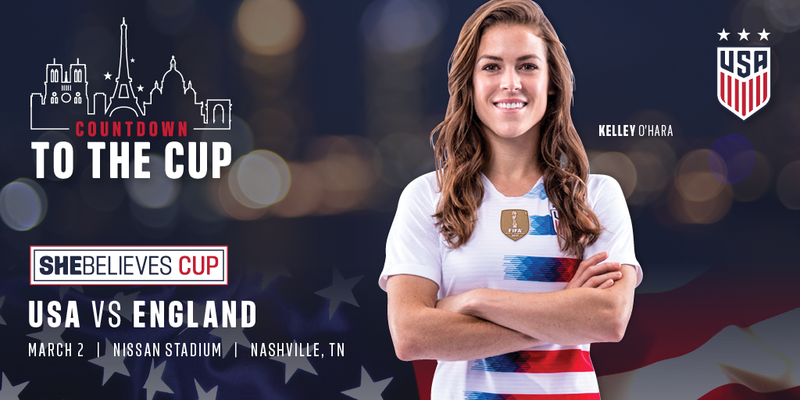 In a 10-game build up to the World Cup dubbed “Countdown to the Cup,” the U.S. WNT will play England at Nissan Stadium on March 2, 2019 in the SheBelieves Cup. Nashville SC Season Ticket Members will have exclusive presale access to tickets for the game. A four-team round robin tournament, the 2019 SheBelieves Cup will include the U.S., England, Brazil and Japan, playing doubleheaders in three cities from February 27 through March 5. Brazil and Japan will open up the March 2 doubleheader at Nissan Stadium at 1 p.m. CT while the U.S. and England will play at 3:30 p.m. The U.S. WNT is 3-0 all-time at Nissan Stadium, taking down Canada in 2004 and France in 2016 by identical 1-0 scores. The USA also beat Scotland 3-1 in 2013. As a part of the SheBelieves Cup, U.S. Soccer will hold a Girls’ Fantasy Camp in Nashville from March 1-4. It will include training sessions with former Women’s National Team players, premium match tickets, behind-the-scenes access and more. The camp is open to girls born in 2005, 2006 and 2007. For more information, contact fantasycamp@ussoccer.org. Season Ticket Members will receive priority for MLS season tickets as well as many other benefits. There aren't many season tickets left so click below or call us at (615) 457-8200 and get yours today!